We will transport you in comfort up into the Kitzbühel mountains with breath-taking views. You can choose from the Hahnenkammbahn, Kitzbüheler Hornbahnen, Panoramabahn Kitzbüheler Alpen cable cars, the Gaisberg 4-seater chair lift and the double chairlift Bichlalm. -50%: Every return ticket purchased comes with a 50% discount for use in the indoor pools at the Aquarena spa centre, Kitzbühel (within 7 days). **Available for holders of guest cards issued by the Kitzbüheler Alpen, Kaiserwinkel and Mittersill-Stuhlfelden-Hollersbach tourist associations. Only valid on presentation of photo ID! Offers and prices are subject to change! 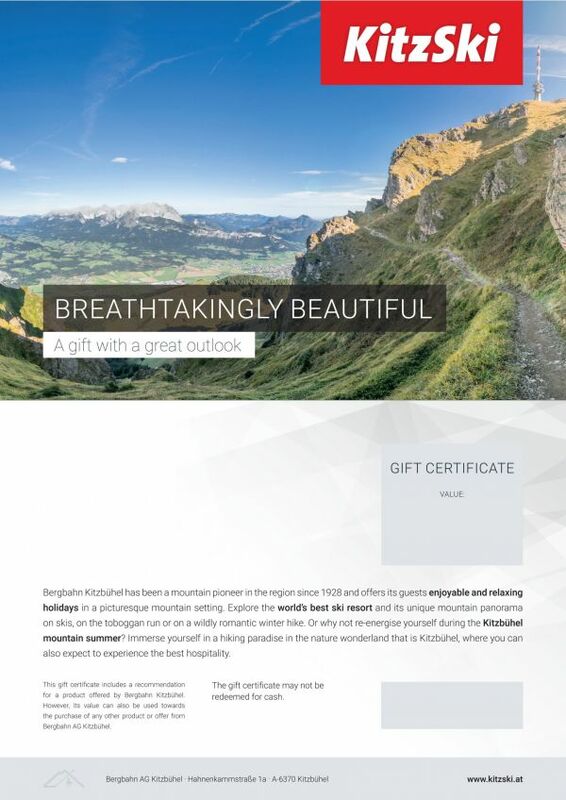 Give the gift of quality time and unique moments in the Kitzbühel Alps. KitzSki vouchers open up a world of extensive hiking trails, various themed trails and spectacular panoramic views of majestic surroundings up to and including the distinctive giants of the Hohe Tauern mountain range.